Entering the 2017-18 regular season, the overriding sentiment was that Vancouver Canucks fans shouldn’t get their hopes up. While professional sports can be unpredictable, not much was expected from the team based in British Columbia. However, when the Canucks started the campaign with a thrilling 3-2 win over Connor McDavid and the Edmonton Oilers, you couldn’t help but get a little bit excited. It was only one game, but beating a team expected to contend this season was still impressive. When Travis Green’s men followed this up with a point against the Ottawa Senators, in a game they should have won, things were looking good. But then, everything returned to normal as the Canucks lost to the Winnipeg Jets and Calgary Flames. There was more than enough blame to go around after the losses, in which Vancouver allowed nine goals. However, Green made a significant move between the pipes and Jacob Markstrom was replaced with Anders Nilsson. This change was almost immediately rewarded, as the Canucks recorded their first shutout of the season in the next game, a 3-0 win over the Senators in Ottawa. Nilsson had his moments, stopping all 32 shots fired at him. He was particularly effective in the first period, as the Canucks were outshot 17-4 but still had a 1-0 lead after 20 minutes, courtesy of a Brock Boeser goal on the power play. While it’s only one performance, Canucks fans are asking if Nilsson is the answer and it’s hard to blame them. After all, the 2009 third round draft pick has a lot of the attributes of a number one goaltender. Despite his size -an advantage in itself – he is remarkably athletic with decent mobility. However, the issue with talent is that at some point it can turn into unfulfilled potential. Despite his upside, we are coming close to this point with the 27-year-old. Consider that Nilsson first played in the NHL during the 2011-12 campaign but has yet to establish the consistency needed to succeed at the top and has never started more than 24 games in a season. There is also the Swedish native’s mindset. One of the reasons he hadn’t started before Tuesday’s game was that he wasn’t mentally ready to play yet, as he admitted to Green, which is puzzling and worrying when you’re meant to be impressing your new team. The simple answer would be “yes”, there’s always some glimmer of hope and in this case, there is a genuine reason for optimism. In the interest of being objective, maybe Nilsson should be commended for being so honest with his coach. How many players would rather pretend that nothing is wrong, potentially leading to issues for the team as a whole (albeit unintentionally)? And while we are concerned the former New York Islander has yet to establish himself in the NHL, at least he is trending in the right direction. Consider, his performances last season for the Buffalo Sabres. Consider his performances last season for the Buffalo Sabres. Yes, Nilsson only started 23 games, but he looked good recording a 10-10-4 record. Most noticeably, he set career bests with a 2.67 GAA and a save percentage of .923. 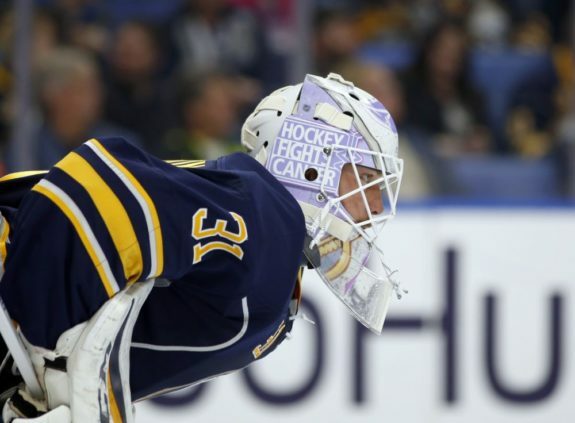 Ultimately, we still believe Anders Nilsson is better-suited as a top backup goaltender in the NHL. However, he should get plenty of opportunity to prove us wrong, as the Canucks continue through what is still expected to be a challenging season.